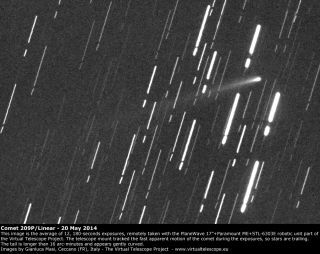 The Virtual Telescope Project imaged Comet 209P/LINEAR on May 20, 2014. The telescope mount tracked the apparent motion of the comet, so stars are trailing. Meteor expert Bill Cooke, head of Meteoroid Environment Office at NASA's Marshall Space Flight Center in Huntsville, Ala., contributed this article to Space.com's Expert Voices: Op-Ed & Insights. For those of us at the NASA Meteoroid Environment Office (MEO), meteors — and meteor showers — are something to be taken seriously. Meteoroids pose a non-negligible risk to spacecraft and astronauts on extravehicular activities. A small 1 millimeter meteoroid moving at 20 kilometers per second has the punch of a bullet — so we spend a great deal of time on models and observations of the meteoroid environment, including meteor shower forecasting. The May 23-24 Camelopardalid meteor shower is created by the Comet 209P/LINEAR, seen here in a NASA telescope image. The state of the art has advanced considerably since the first forecasts for the Leonid meteor storms of 1999-2002, and researchers can now confidently predict Leonid, Perseid, and some other meteor shower outbursts with great precision, getting the times of the peaks to within just a few minutes and the meteor rates to within a factor of two. However, Mother Nature has ways of letting us know that there is still much to learn, and with the upcoming Camelopardalids in May, we find ourselves once again confronting unknowns. The new meteor shower is created by the Comet 209P/LINEAR. NASA meteor expert Bill Cooke, head of the Meteoroid Environment Office at the Marshall Space Flight Center, is hoping for an impressive display from the new Camelopardalid meteor shower on May 23-24, 2014 caused by dust from Comet 209P/LINEAR. Our forecast models do well at predicting shower activity caused by Halley family comets (Halley, Swift-Tuttle, Tempel-Tuttle, etc. ), but are not so good when it comes to meteor showers caused by Jupiter family comets, such as Comet Giacobini-Zinner, the source of the Draconid meteor shower each October. The radar outburst of Draconids in 2012 was a big surprise to meteor researchers, as the forecast models did not show a large number of small particles from Giacobini-Zinner near Earth in October of that year. Like the Draconid parent, Comet 209P/LINEAR is a Jupiter family comet; it and its debris are perturbed by the giant planet Jupiter's gravity, which adds complexity when we attempt to predict what will happen in the early morning hours of May 24. The comet was not discovered until 2004, but computer models show that particles produced by its outgassing in the 18th, 19th, and early 20th centuries will intersect Earth's path this year, but how do we go from the number of particles in the computer simulation to the actual number of meteors? Meteor shower forecasts are usually calibrated by running the model for past years and comparing its output to the observations of the actual meteor rates — but, what do you do when the shower has never been seen before? This is the same sort of uncertainty that existed back in 1993, though the cause is different. With the Perseids, plenty of observations existed, but computers were not yet powerful enough to sling millions of simulated particles off a simulated comet and track their paths until they intersected Earth; the situation is reversed with the 2014 May Camelopardalids— we have no past observations of this shower with which to calibrate the model. Observations of Comet 209P/LINEAR made since its discovery have shown that it is a poor dust (debris) producer. We in the MEO — and other researchers around the world — have been wrestling with the May Camelopardalids for the past couple of years. Will there be a new meteor shower gracing North American skies on May 24? If so, will it be intense enough to not only produce a spectacular sky show, but also pose a risk to spacecraft? The honest truth is that — despite all our advances in computer technology and in meteor shower forecasting — we, like all those skywatchers across the continent, must wait for the shower itself to provide the answer. I am confident that the time is correct — something should happen in the predawn hours this Saturday, if the comet produced more debris in the past than it does now. If not, then there will few meteors, or nothing at all. I and my colleagues will be watching the skies, for who would have thought that simply counting meteors coming out of an obscure constellation near the North Star would tell us how active a comet was hundreds of years before its discovery? The new Camlopardalid meteor shower is created by debris from the Comet 209P/LINEAR. The Earth will pass through that dusty debris on May 23 and 24, 2014 as shown in this NASA map of the comet debris. Bill Cooke and colleague Danielle Moser also offer this NASA PDF guide to watching the May Camelopardalid meteor shower. Follow all of the Expert Voices issues and debates — and become part of the discussion — on Facebook, Twitter and Google +. The views expressed are those of the author and do not necessarily reflect the views of the publisher. Follow us @Spacedotcom, Facebook and Google+. Original article on Space.com.